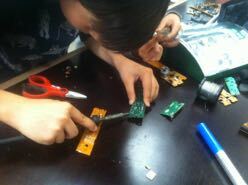 In this workshop we will open old electronic devices, we will remove its parts, and we will gather them in order to create new recycled gadgets: ornaments, small mockups, figures, etc. Come and let's have fun with the inside of a computer! Note: you can bring your own old electronic devices. But bear in mind... they will not be returned in the same conditions!